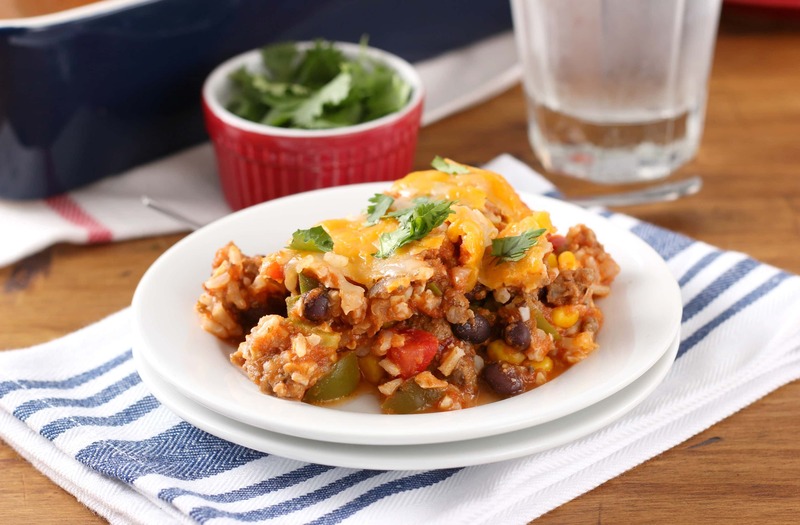 You can enjoy all the flavors of stuffed peppers without going through all the worked of making stuffed peppers by whipping together this easy, hearty lightened up southwestern stuffed pepper casserole! *This post is from 10/19/12. Images updated 10/7/16. I figured it was time for something savory after so many sweets. Though a scone or perhaps a slice of coffee cake wouldn’t be a bad way to start off the morning! 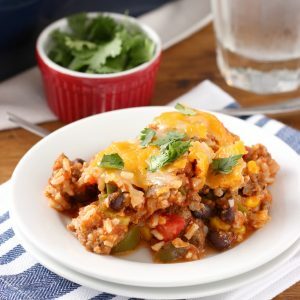 Anyways, if you are looking for a quick weekend meal to fit in around all of your activities, this southwestern stuffed pepper casserole is for you! With a little prep work, such as chopping veggies and making rice that can be done the night before, you can have a hearty meal loaded with veggies, meat, and complex carbs in no time. Plus, it makes a lot and the leftovers heat well, so you can make a couple of meals out of one time of preparation! I have made a more traditional lightened up stuffed pepper casserole version before, and it quickly became a favorite because of how good it was and how easy it was to prepare. However, I’m always looking for ways to add more veggies to meals and the addition of black beans and corn fit perfectly! The first time I made this variation, it got eaten before any pictures could be taken, so I figured that was a good sign and made it again. Have a great weekend! Cook ground beef in a large skillet until no longer pink. Drain excess grease. Add onion, garlic, green peppers, and salt. Cook until onions turn translucent. In a large bowl, stir together rice, spaghetti sauce, corn, beans, tomatoes, and ¾ cup shredded cheese. Add in ground beef mixture and stir until combined. Spread mixture in a 2½ quart casserole dish. Sprinkle remaining ¾ cup shredded cheese over the top. Bake for 25 minutes or until cheese begins to brown. You had me at “quick.” This looks delicious. Pinned! I love stuffed peppers but never thought about it in a casserole! Can’t wait to try this one out. 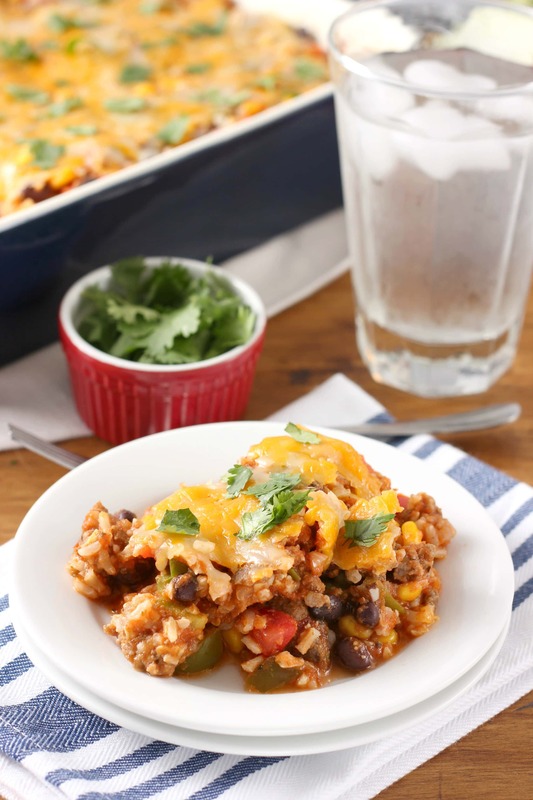 I think I’ll try this with ground turkey instead… awesome, hearty recipe for this time of year! Great idea to turn stuffed peppers into a casserole! I love how quick this is! Can I please have the whole thing? Please? Looks delicious! I’ve been kind of obsessed with stuffed peppers lately. I’m a hunt for a good recipe because I’ve been craving them like crazy. 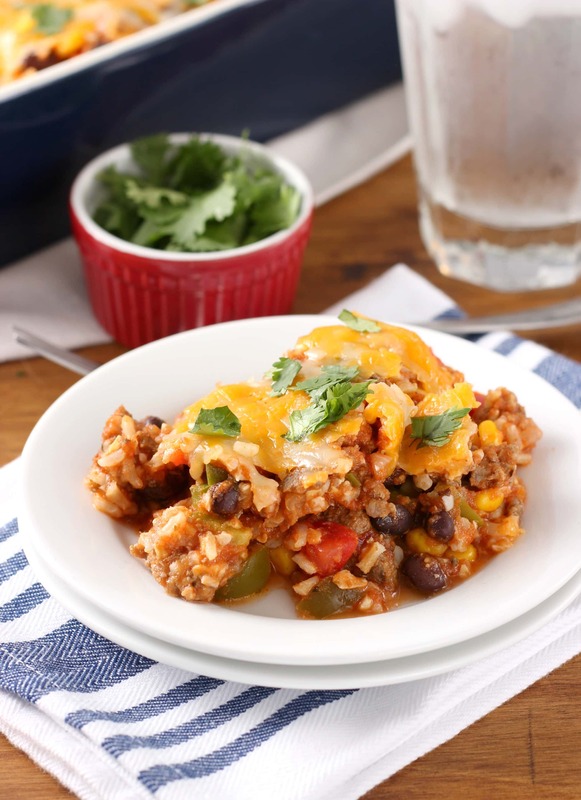 Doing a casserole is a great idea and I love the Southwestern twist! Thanks Valerie! I like the flexibility of making a casserole! I love stuffed peppers! 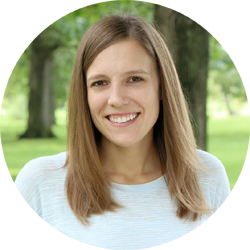 Sometimes a break from the sweets is a good idea on the blog… keeps readers on their toes! my baking blog doesn’t have room for savory items and I wish I could cook like I baked. Anyway, this casserole looks amazing! Ooooh, the melted cheese topping has me drooling! LOVE it! Yummy! Great comfort food for autumn! I like this so much better than actual stuffed peppers. Don’t get me wrong, I love the flavor of stuffed peppers, but I make such a big ol’ mess when I eat them. Here’s to clean shirts! this sounds perfect. my husband is not a fan of stuffed peppers, but he would eat this for sure! Oh my goodness I need my fork! Deliciousness! Have a great weekend sweetie! This sounds sooooo good! Love me some comfort food! the melted cheese is calling my name! Loved this recipe! Found it on pinterest, thank you for sharing. I think next time I will half it as it’s just me and my husband and it’s a big casserole. I also added red, yellow, and orange bell peppers and used ground turkey instead. Delish!! Oh, yum! I love stuffed peppers but never eat them because my husband is a pepper hater. I know I’d love this casserole! Yum, yum! I love stuffed peppers, so I can bet this casserole is so delicious! i found this recipe from pinterest, and it’s in the oven now! it smells and looks delicious. next time, i will probably make half of the recipe since it’s just me and my boyfriend. i can’t wait to try it. 😉 thanks for the recipe, and i love your blog! Stuffed peppers are comfort food in my house, this looks amazing! I love how much easier it is to make stuffed peppers in a casserole version! Love the Southwest flavors in here! 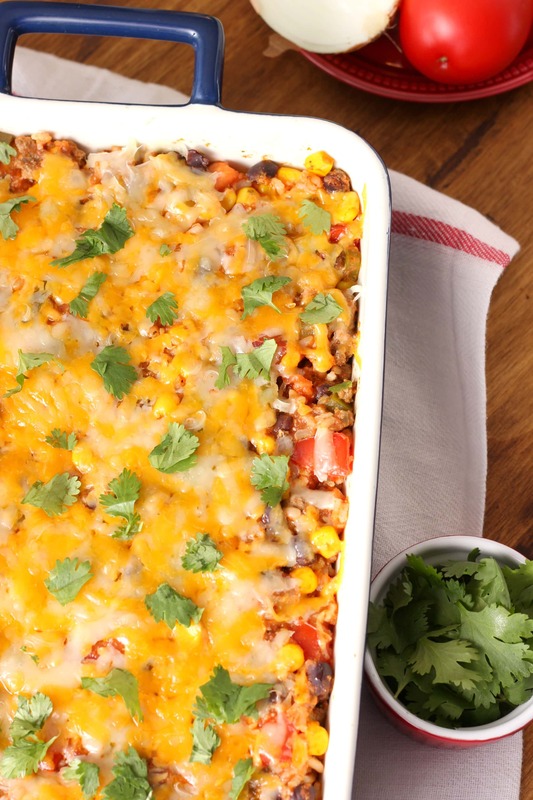 Love a comfort food casserole like this! Looks so delicious! I am always looking for quick dinner ideas. Casseroles are always my favourite because… leftovers! This looks delicious!